These scenes were meticulously scratch built stamp by stamp. The stamps really pound and echo as the ore is crushed mercilessly until the end of the shift when the scene settles down to a peaceful and serene setting. But don't worry, the mill will start another shift all too soon. Listen closely and you will hear the crew, the boiler, the pulleys and belts come up to speed, then the stamps are engaged and pound and grind away, seemingly endlessly, amidst the appropriate clatter of whiffle tables and the clanking of machinery... when the shift whistle blows everything slowly grinds down to a complete stop... except the critters. Between shifts you may hear some light maintenance work being done in the mill. 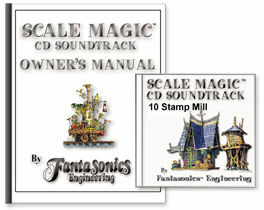 CD includes day and night scenes, all scratch built with our spellbinding Scale Magic imaging.